Used restaurant furniture can save you a lot of money on your initial investment when opening a restaurant of your own. You just need to be prepared with a plan for the type furniture you need to buy before you begin looking. One of the most important things to consider when planning what type of restaurant furniture to buy is the amount of space you have to work with. If you have a very large floor plan, you have the option of buying many small tables or a combination of both larger and smaller tables. You can also decide if you would like to include a section for booth seating. You will need to determine if you have enough space for a few corner booths or if you should just stick to standard size booths. Before you begin shopping, take accurate measurements around the dining area so you know exactly how much space you have to work with. After you have determined the approximate size of the dining area where your customers will be seated, you will next need to focus on how you want to design the dining area. Are you opening a casual, family-friendly type of restaurant or is it going to be a luxurious fine dining establishment that caters more towards adults? Perhaps what you have in mind is more of an eclectic, hip hang out for young adults who want to mingle with drinks and appetizers. In each of these scenarios, you would be looking for very different types of used restaurant furniture. For a casual, family friendly type of restaurant, you would want simple furniture that is very easy to clean. If your restaurant is going to be an exclusive, fine dining establishment, you may want to opt for classier looking tables and chairs with decorative fabric seats. Just make sure you treat the fabric with a stain resistant treatment beforehand and be prepared to have the upholstery professionally cleaned periodically. If you plan to have booth seating, look for booths that have very high backs so that customers can dine in privacy. If your restaurant is marketed towards young adults and the dating scene, try to find more modern furniture that is casual yet comfortable. Instead of standard tables and chairs, you could provide couches with tables for part of the room, combined with bistro or pub style tables and stools for other areas. Modern looking furniture in bright colors would work well for this type of restaurant. Of course, if your restaurant has a bar, you will need to be on the lookout for some good used barstools. Just make sure you take measurements of how high your bar is so that the stools will be a good fit. One of the results of the struggling economy is an increase in the availability of used restaurant furniture, due to the high number of restaurants being forced to close their doors. This unfortunate turn of events for some brings about new opportunity for others. One way to find used furniture from restaurants is by searching online for restaurant closings in your local area. If you find a restaurant similar to the one you intend to open and think the furniture would be a good match, contact the owners and let them know you are interested in buying their furniture. These companies also have showrooms in the southeastern United States. Restaurant Equipment World has a showroom in Orlando, Florida. Restaurant Equipment Market has a showroom in Atlanta, Georgia. Beltram Foodservice Group has several showrooms throughout Florida including Tampa, Ft Meyers, Tarpon Springs, Sarasota and Brandon. 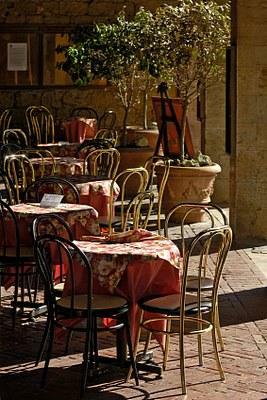 Start your search for used furniture early on in the planning stages of your restaurant. It may take time to find exactly what you're looking for, but the money you'll save is worth the extra time and effort.